Maps are being updated..... check back to see progress. You get Ansuz rune from chest in entrance area Kill the Dead Wizard (Lvl 54) for the key. You get Berkano rune from chest in Boss area Kill the Dead Wizard (Lvl 55) for the key. You get Dagaz rune from chest in Boss area Kill the Dead Wizard (Lvl 55) for the key. You get Ehwaz rune from chest in Boss area Kill the Dead Wizard (Lvl 57) for the key. You get Fehu rune from chest in Boss area Kill the Dead Wizard (Lvl 60) for the key. You get Halagaz rune from chest in Boss area Kill the Dead Wizard (Lvl 62) for the key. 11 bridges needed x 2 for orb, they collapse before you can get back. other gaps are only 1 bridge wide. You get Isa rune from chest in Boss area Kill the Dead Wizard (Lvl 64) for the key. You get Ingwaz rune from chest in Boss area Kill the Dead Wizard (Lvl 65) for the key. You get Raidho rune from chest in Boss Mini Maze area Kill the Dead Wizard (Lvl 67) for the key. Advice: Take 10+ Cure Poison pots out of this area for spider level. 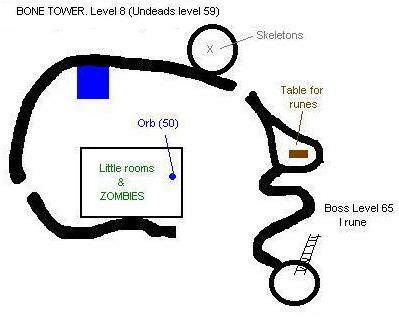 Secret Area can only be accessed from level 10 table (spiders). There are 2 orbs ■ here at 88,240, & 157,195. Table ■ to access secret area is in the EU "like" section. Two diary ■ books can also be found there. 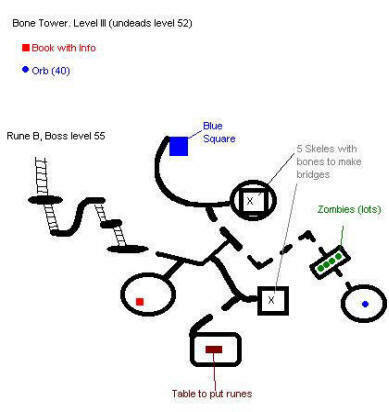 Top left corner of Map is N.
Level 11 (secret) consists of a straight path with only 3 simple skellies on it to kill, The rest of the skellies on the two flanking islands (12 each) you can ignore, if your imm is high enough (140), otherwise be prepared for a barrage of FB. 3 lvl 50 orbs on this level. First off, get as many leg bones from skeletons as you can. Use one on another to assemble them into bridges (5 in a stack complete a bridge). You will need *lots* of bridges to complete the bone tower, and will more than likely have to assemble more as you go along. Each level from 1 to 9 has a blue square, and all levels (including spider and hidden levels) aside from the first have a green jewel on the floor that you can use to be transported back to the blue square on level 1. 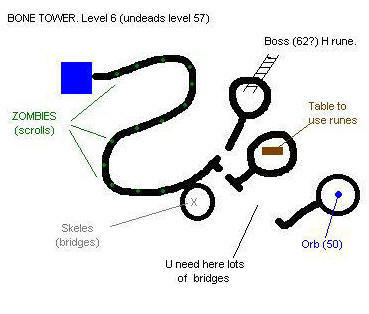 As you go through the Bone Tower, you'll need to kill the Dead Wizard accessed from each level up the staircase. He has a key on his body that opens a chest located somewhere in the area he is in. The chest contains a rune, and each level has a different rune; take 2 of each rune. There are 9 runes in all (A, B, D, E, F, H, Isa, Ing, R). ..Now what good are these runes? For starters, you can place any rune on any table, then activate it ("use" the little button on the table) and you will the transported to the start of the rune's corresponding level. Next, if you use any pair of runes (on any table), you will be rewarded with a sizeable chunk of experience. I'd do this as soon as you can. If you do all 9 pairs in one run, you'll probably level once or twice. Finally, if you use one of the combos you found from the scrolls, or the bonus combos, you will be rewarded with +1 in the corresponding stat shown in the tables on this page (it adds just like the zombie showdown hp and mana scrolls). If you are going to be leveling your char high enough to max out your bases, it's best to save these combos till you are almost maxed out, since it costs a lot more exp to raise a skill by one then than it does earlier on. On level 9, random zombies also have cure poison potions on their bodies. Take at least 10 with you, as you will need them on the spider level (swarms of spiders in there). The orbs in the spider level are at the far east and the far west corners of the map (north is up on your screen). 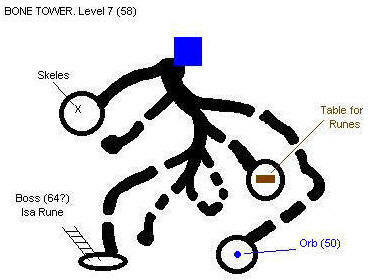 The rune table is found by entering an area similar to the entry building of Earth Underground, which is south-west of the western-most orb. 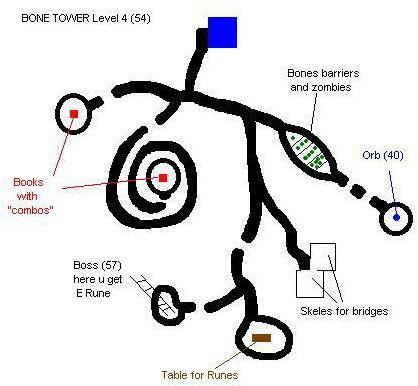 There are some ancient diaries in this area that explain some of the story behind the bone tower, if you care to read about it. The page 90 combo that you find, if used on table in the spider level, takes you to a Hidden Level with 3 lvl50 orbs. There are 3 skeletons blocking your way, along with about 12 on each side of the path you walk along. These extra skeletons can't be reached, but can be fired at with FB/LB, and if your immunity isn't high enough, (140) they will shoot FBs at you. 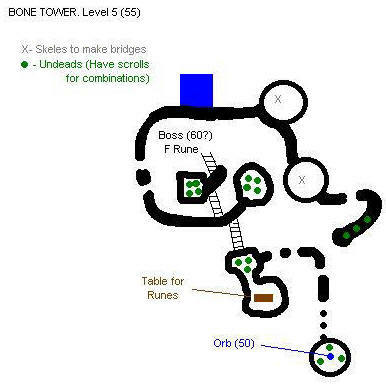 After getting these 3 orbs, walk back to where you entered from, and use the green jewel on the ground to return to the beginning of the Bone Tower. Now that you're done, I recommend you keep 1 of each rune in your stash so that you can get your orbs quicker when they respawn. Be careful! The Bone Tower is no place to die.